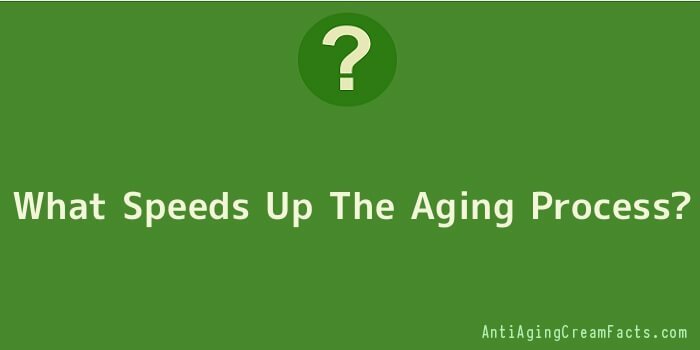 What Speeds Up The Aging Process? For the most part, skin that you perceive as being old is probably sun-damaged. It’s true that skin gradually breaks down as you age, but if your skin had never been touched by the sun, the look and feel of old skin wouldn’t show up until very late in life. Protecting your skin from the sun is the most significant thing you can do to prevent wrinkles, sagging and discoloration. Smoking also ages your skin before its time; it reduces blood flow to the skin, which leads to wrinkles and interferes with the skin’s natural defence against free radicals Rich Man, Poor Man, Beggar Man, Thief, all will go through the aging process. However, how well we endure that process will depend on the individual. By slowing down the aging process, we are extending our life expectancy. Many factors are involved in the aging process. All these factors impact the Respiratory, Cardiovascular, Nervous, Musculoskeletal, and the Immune Systems. Each system reacts to its own physiological makeup. Therefore, how we treat these systems and the environment in which we live in directly will determine the response to the aging process. The respiratory system can severely be impacted by environmental influences such as exposure to smoke, toxic chemicals and air pollutants. These influences cause a progressive deterioration of the functioning structures of the lungs and bronchial tubes. Added to this, are age related changes that increase the respiratory effort. Those are the changes in the other systems of the body that also directly affect the respiratory system. The musculoskeletal system, comprised of the muscles, tendons, ligaments, connective tissues, and the fascia are the glue that binds the body together. It is here in these tissues that the individual is apt to notice the progressive changes of aging. Basically, these connective tissues lose water and start to dry-up, as we grow older. This drying out process of the tissues causes them to lose the elasticity we enjoyed in earlier years. They will become more brittle and injuries are more likely to occur. Our flexibility is reduced, so we move, walk and bend with increased difficulty. The respiratory system is affected due the loss of flexibility of the muscles involved in the breathing process, therefore affecting all the chest structures. That is why the process of aging, other than is normally due to “Father Time”, can be directly related to our sedentary lifestyle. Inactivity, due to the lack of exercise, affects the architectural structures and thus speeds-up the “aging process”. It is inevitable that we all grow old, but it is not inevitable to grow old in such a manner as not to be able to bend down and tie our shoelaces, or do the everyday ordinary chores without the resultant aches and pains. Slowing the “aging process” therefore, depends on the individual and what steps they employ to do this. With the proper steps you can turn back “Father Time”. In other words you can reduce your “real age” to your “chronological age”. A realistic plan to best achieve this goal would be as follows: Start a regular exercise program and stick to it. It has been found that 50% of the people who start an exercise program will stop it in 3 to 6 months. Control your diet. Eat less fat, especially animal fat and dairy fat. Eat more fruits and fresh vegetables. Reduce your sodium and sugar intake. Omit eating white processed flour and rice. Limit your exposure to the sun. But 15 minutes at least three times weekly is advisable because the body manufactures vitamin D from the sun exposure. Watch your weight, avoid obesity and limit your calories. Lose weight if you are overweight. Drugs to lose weight should not be taken unless the individual is morbidly obese. Limit your consumption of alcohol and caffeine. Alcohol should be limited to no more than one or two drinks daily, and caffeine to no more than one or two drinks daily. Avoid cola sodas entirely. Reduce and avoid stress as much as possible. Try to get at least 30 minutes of quite time, where you can put your feet up, relax and think good thoughts. Instead of driving, walk when you can. When you do drive, drive within the speed limits and drive defensively. Walk up and down stairs when possible. Go to sleep the same time each night. Do not watch television in the bedroom. Keep the bedroom airy and darkened. Flossing your teeth on a daily basis and visiting your Dentist once or twice a year to prevent gum disease can prolong your life. Gum disease has been shown to contribute to heart disease and other diseases. Exercising keeps your body working at its optimal capacity. It keeps you flexible, and strengthens your muscles and all the body systems. By keeping your body toned, you will be more vigorous, walk taller and go about your daily chores in a more vital manner. The newfound vitality will help you enjoy life more and live a happier lifestyle. None of the statements made on www.antiagingcreamfacts.com have been reviewed by the Food and Drug Administration (FDA). The advices and products mentioned on www.antiagingcreamfacts.com are not intended to diagnose, treat or prevent any diseases. You should consult with your doctor before using any product mentioned on www.antiagingcreamfacts.com. We may receive commission or other income on certain products. However, this does not impact our reviews and comparisons mentioned on www.antiagingcreamfacts.com. We try our best to keep things fair and balanced, in order to help you make the best choice for you. Any and all trademarks, logos, brand names and service marks displayed on www.antiagingcreamfacts.com are the registered or unregistered trademarks of their respective owners.